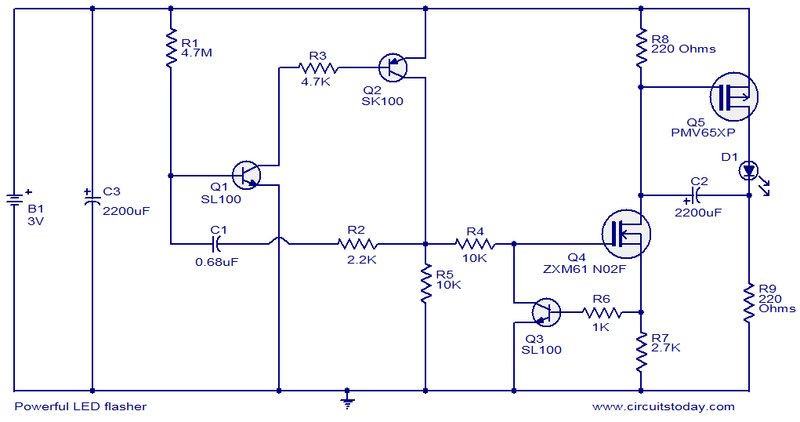 This is the circuit diagram a powerful LED flasher. High power LEDs are very common in the market now and a 1W high power LED is used here. Transistors Q1 and Q2 are wired as an oscillator which produces positive pulses of width 20ms @ Â½ Hz. Transistor Q3 and MOSFET Q4 inverts this pulse and MOSFET Q5 drives the LED D1. LED D1 is a 1W high power LED. Capacitors C1 and C2 must be rated 10V. Circuit can be powered from two AA cells connected in series. The peak LED current is set to around 250mA. Can I put 3 or 4 leds in parallel ? No. already 1 watt LED is used. the limit is 350mA only.